Recent release “Evidence of Evil” from Page Publishing author Darlynn Monan is centered around Valerie Martin, a thirty-four-year-old, single woman with three devoted friends whose life enters into a mysterious path of anonymous messages, murders, and government-related secrecy she must unravel, decipher, and solve to remain alive. Darlynn Monan, a former model, starlet, lyricist, artist, author of one previous book, corporate financial officer, and small business owner, has completed her new book “Evidence of Evil”: a gripping and potent story of Valerie Martin, who suffers from memory loss due to a traumatic event as a child, who turns thirty-four with her devoted group of friends around her. After this fateful birthday, Valerie’s life enters into a mysterious path of mystery, murder, and intrigue. Published by New York City-based Page Publishing, Darlynn Monan’s gripping tale centers around Valerie Martin, an unattached woman with three devoted friends, who reaches her thirty-fourth birthday when suddenly her life is turned upside down. Valerie’s world evolves into anonymous messages, murders, and government-related secrecy. She must unravel, decipher, and solve the mysteries around her in order to save her own life. 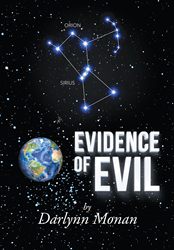 Readers who wish to experience this chilling work can purchase “Evidence of Evil” at bookstores everywhere, or online at the Apple iTunes store, Amazon, Google Play or Barnes and Noble.